"Luther And His World" examines the central figure in the Protestant Reformation of the sixteenth century. The author explains Luther's background, and helps the reader to understand the process that led up to his rebellion against the late medieval church. The world of the early Reformers is brought vividly to life, together with their battles and disagreements over what was right doctrine and what was not, and how the church should go forward. Finally, the author offers an assessment of Luther's significance for and contribution to western culture and Christianity. - Publisher 'An accessible account of Luther, his life, thoughts, writings and all that surrounded him. Tomlin's writing is readable and informative...For most people, this packed-full, not so little, littlebook will be just enough for them to feel that they now "get" Martin Luther.' - Church of England Newspaper One of the towering characters of the Reformation, Martin Luther's actions, beliefs and writings have had an incalculable effect on the lives of millions of people. In this engaging book, Graham Tomlin paints a vivid picture of Luther's life, from his early struggles with faith to his emergence as the leading figure in the Reformation. The man revealed here is obstinate, sensitive, blunt and determined - willing to risk all for his convictions. Graham Tomlin is Dean of St Mellitus College, London. He was formerly a member of the Faculty of Theology in Oxford University, teaching on Martin Luther and theReformation. He is the author of many articles and several books, including The Power of the Cross: Theology and the Death of Christ in Paul, Luther and Pascal (Paternoster 1999), The Provocative Church (SPCK 2002) and The Prodigal Spirit: The Trinity, the Church and the Future of the World (SPTC 2011). 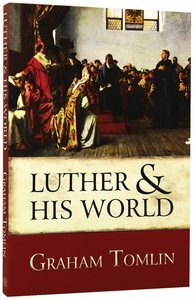 About "Luther and His World: An Introduction"
'An accessible account of Luther, his life, thoughts, writings and all that surrounded him. Tomlin's writing is readable and informative...For most people, this packed-full, not so little, littlebook will be just enough for them to feel that they now "get" Martin Luther.' - Church of England Newspaper One of the towering characters of the Reformation, Martin Luther's actions, beliefs and writings have had an incalculable effect on the lives of millions of people. In this engaging book, Graham Tomlin paints a vivid picture of Luther's life, from his early struggles with faith to his emergence as the leading figure in the Reformation. The man revealed here is obstinate, sensitive, blunt and determined - willing to risk all for his convictions. Graham Tomlin is Dean of St Mellitus College, London. He was formerly a member of the Faculty of Theology in Oxford University, teaching on Martin Luther and theReformation. He is the author of many articles and several books, including The Power of the Cross: Theology and the Death of Christ in Paul, Luther and Pascal (Paternoster 1999), The Provocative Church (SPCK 2002) and The Prodigal Spirit: The Trinity, the Church and the Future of the World (SPTC 2011). The Revd Dr Graham Tomlin (D.Phil., Oxon) is the Dean of St Mellitus College, London. He has authored a number of books including The Power of the Cross: Theology and the Death of Christ in Paul, Luther and Pascal (Paternoster 1999), The Provocative Church(SPCK 2002), The Responsive Church,(Intervarsity Press, 2002), The Seven Deadly Sins and How to Overcome Them (Lion 2007), Luther and his World (Lion 2002), and Spiritual Fitness (Continuum, 2006).